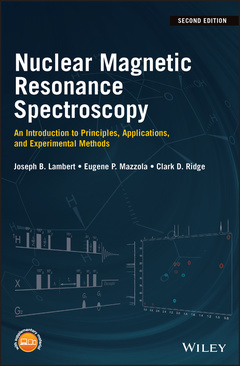 Nuclear Magnetic Resonance Spectroscopy Lambert Joseph B., Mazzola Eugene P., Ridge Clark D.
Authors: Lambert Joseph B., Mazzola Eugene P., Ridge Clark D.
Add to cart the livre of Lambert Joseph B., Mazzola Eugene P., Ridge Clark D.
Designed to cover a full course in Nuclear Magnetic Resonance (NMR) Spectroscopy, this text offers complete coverage of classic (one-dimensional) NMR as well as up-to-date coverage of two-dimensional NMR and other modern methods. It contains practical advice, theory, illustrated applications, and classroom-tested problems; looks at such important ideas as relaxation, NOEs, phase cycling, and processing parameters; and provides brief, yet fully comprehensible, examples. It also uniquely lists all of the general parameters for many experiments including mixing times, number of scans, relaxation times, and more. Nuclear Magnetic Resonance Spectroscopy: An Introduction to Principles, Applications, and Experimental Methods, 2nd Edition begins by introducing readers to NMR spectroscopy - an analytical technique used in modern chemistry, biochemistry, and biology that allows identification and characterization of organic, and some inorganic, compounds. It offers chapters covering: Experimental Methods; The Chemical Shift; The Coupling Constant; Further Topics in One-Dimensional NMR Spectroscopy; Two-Dimensional NMR Spectroscopy; Advanced Experimental Methods; and Structural Elucidation. By offering a balance between volumes aimed at NMR specialists and the structure-determination-only books that focus on synthetic organic chemists, Nuclear Magnetic Resonance Spectroscopy: An Introduction to Principles, Applications, and Experimental Methods, 2nd Edition is an excellent text for students and post-graduate students working in analytical and bio-sciences, as well as scientists who use NMR spectroscopy as a primary tool in their work. Joseph B. Lambert, Ph.D., is Research Professor of Chemistry at Trinity University. Eugene P. Mazzola, Ph.D., is an adjunct professor of chemistry at the University of Maryland as well as a researcher at the UMD-FDA Joint Institute for Food Safety and Applied Nutrition. Clark D. Ridge, Ph.D., is an NMR spectroscopist based at the Health and Human Sciences division of the FDA at College Park, Maryland.